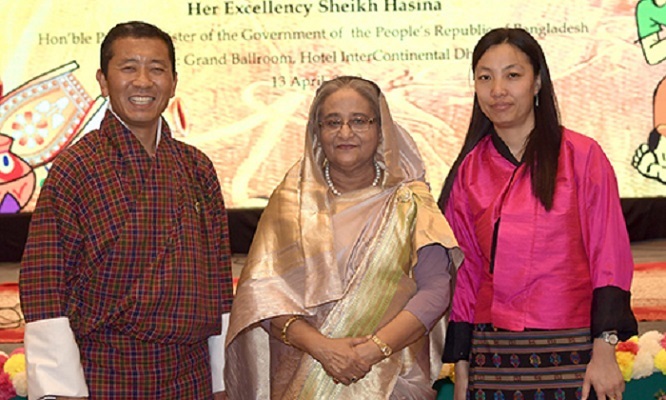 Prime Minister Sheikh Hasina on Sunday hosted a state banquet in honour of the visiting Bhutanese Premier Dr Lotay Tshering. She hosted the banquet at the Grand Ball Room of the Hotel Intercontinental in the capital. Jatiya Sangsad Speaker Dr Shirin Sharmin Chaudhury, Chief Justice Syed Mahmud Hossain, ministers, PM’s advisers, senior Awami League leaders, parliament members, dignitaries and high civil and military officials were present on the occasion. Dr Lotay arrived in Dhaka on Friday morning on a three-day official visit at the invitation of Prime Minister Sheikh Hasina.